Liberation theology, although most strongly associated with the Catholic Church in Latin America, is not uniquely Catholic, or even uniquely Christian. Rather, the concept of liberation is a facet of all religions that challenge the injustice and poverty that are the byproducts of neoliberal economics. Moreover, though the term “liberation” often carries a religious connotation, liberationist principles can exist even within secular ethical theories, notably environmental justice, that do not expressly use the term “liberation.” Similar to how liberation extends beyond the bounds of religion,steadily growing concerns over climate change and other environmental problems are also not confined to religion, let alone any particular religion. The twenty-first century is witnessing the emergence of a new ecological conscience, and as the world’s largest economic power, the United States has the opportunity to place itself in the vanguard of a global environmental movement toward greener and more sustainable practices. Rising sea levels, unpredictable weather, and dwindling natural resources make it increasingly difficult to maintain the notion that nature is beyond our ability to hurt and its bounty beyond our ability to deplete. Americans’ changing attitudes and behaviors regarding sustainability in this Anthropocene era indicate a sobering realization that unchecked greenhouse gas emissions have created a tragedy of the atmospheric commons. Increasing awareness of the magnitude of climate change and other pressing environmental concerns has begun shifting our collective environmental values toward an ethical posture that acknowledges the continuity and interdependence of all life, thus laying bare the logical conclusion that our mistreatment of the natural world translates into mistreatment of the poor, who are especially vulnerable to environmental harms. The mutability of environmental ethics, however, strains against the intractability of environmental law, whose overreliance on economic principles and stilted doctrine has locked it into a narrow and anthropocentric outlook that perceives environmentally responsible practices solely as instrumental, rather than intrinsic, goods. Changes in climate, both literal and metaphorical, have created a world where environmental rights and human rights are no longer distinct concepts. Yet current environmental law fails to adequately serve the public good because an outdated approach to valuing the environment and situating humans in relation to it prevents the law from evolving to conform to contemporary values. Though remedying this problem is a gargantuan task with no simple solution, this paper argues that the market-based principles and inflexible legal doctrines that have historically governed environmental law should yield to a liberationist ideal already taking root in environmental ethics, an ideal that recognizes “[t]here is no separating human beings from ecological nature,” and therefore seeks to protect human interests by protecting the interests of the natural world. 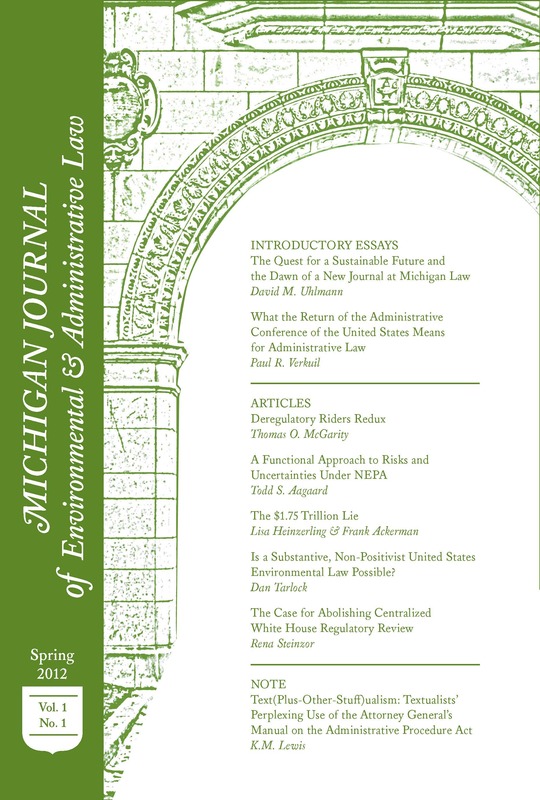 Part II of this paper provides an overview of several strands of environmental ethics that rose to prominence over the last forty years, most notably value theory, which strongly influenced the policies underlying many of the major pieces of environmental legislation passed in the late 1960s and early 1970s. That section also explores the concepts of ecojustice and environmental justice, two approaches to humanity’s ethical duties toward the environment rooted in social justice. It further argues that environmental ethics has taken a backseat to utilitarian, economics-centered policies because of its perennial struggle to find purchase in the realm of environmental law. Part III argues that although lawmakers on the federal and state levels are finally formulating legislative and regulatory plans to address major environmental problems like climate change, efforts to put these plans into action are hindered by two systemic shortcomings of current environmental law: cost-benefit analysis and standing doctrine. Part IV returns to the concept of liberation, first analyzing how it overcomes or avoids many of the problems other theories of environmental ethics have faced. Next, it explains that emergent twenty-first century environmental values indicate a movement toward a liberationist approach to environmental ethics, and concludes by exploring how the truest expressions of this movement—the notions of uncanniness and planetarian identity—can correct the shortcomings of existing environmental law. Given the vast history of environmental ethics, even just in the United States, this paper will limit its focus to several major developments in environmental ethics from the latter-half of the twentieth century and their interaction with environmental law. Of particular interest is the influence of value theory—“what matters and why”—on environmental ethics and law. Value theory was at the forefront of environmental ethics from the late 1960s through the 1970s, the “golden age of environmental law” that saw Congress enact the most significant of the country’s environmental legislation, including the National Environmental Policy Act (NEPA), Clean Air Act, Clean Water Act, and Endangered Species Act (ESA). This section is divided into three parts. The first offers a quick overview of value theory as applied to environmental ethics, focusing on the distinction between nature as an intrinsic good and an instrumental good. The second part considers the concepts of “ecojustice,” a Christian strategy of environmental ethics that views nature as an intrinsic good, and “environmental justice,” a (mostly) secular approach to environmental ethics that regards nature as more of an instrumental good. The third part explains the limits of value theory, and why these limits ostensibly make it unworkable from the perspective of environmental law. Willis Jenkins, a professor of environmental theology and ethics at the University of Virginia, has noted that, compared to other fields of “practical ethics,” environmental ethics struggles to reach a consensus on what it is actually trying to achieve and how it should go about achieving it. This is because environmental ethics has trouble agreeing on why people should find that nature has value, and thus regard environmental issues as morally important. Several different strategies have arisen that attempt to answer this question, and arguably the best known of these is something Jenkins identifies as “the strategy of nature’s standing,” a name that carries obvious legal overtones. This strategy attempts to situate moral value within nature itself, but when it emerged during the golden age of environmental law, ethicists quickly realized “that the inherited vocabularies of ethics could not capture the value of nature, focused as they were on human interests (consequentialism) and rights (in deontological and contract theories).” Accordingly, a new theory of nature’s value was needed, and the question became whether nature held “intrinsic value” for humanity in addition to mere “instrumental value.” In other words, is the natural world just “a means to some other end” (instrumental value), or is it “an end in itself” (intrinsic value)? Ultimately, Bohannon and O’Brien conclude, the differences between ecojustice and environmental justice trace back to “the social location of [their] advocates. While environmental justice is a movement that emerged in inner cities and poor rural areas, eco-justice was developed by scholars, ministers, and academic theologians on university campuses.” In other words, ecojustice comes from a place of social and economic privilege that environmental justice does not, and therefore ecojustice, despite all its good intentions, lacks self-awareness when it attempts to synthesize human and nonhuman interests under a single holistic vision. This limitation on ecojustice’s ability to fully connect with those suffering the worst instances of injustice thus seems to eliminate it from the running as truly practical Christian environmental ethic. Similarly, the strategy of nature’s standing, which also seems unable to generate a fully inclusive theory of the natural world’s value, appears to be unworkable as a secular environmental ethic. Indeed, some commentators suggest that environmental justice holds an advantage over the strategy of nature’s standing because whereas that value theory-laden approach struggles to find agreement on the criteria that give nature its moral worth (and therefore struggles to identify social practices adequate to protect that worth), environmental justice’s “ecological anthropology” lends itself to economic approaches that better jibe with the strictures of environmental law. As we will see in Part III, however, even though environmental justice should in theory be able to curtail the consequentialist excesses of economic theories of environmental value, in practice cost-benefit principles frequently arrive at notions of “public good” that actually do more harm than good. Jedidiah Purdy identifies two limits on value theory’s practical application that, despite the theory’s prominence in both secular and religious environmental ethics in the 1970s, undermined its ability to have a lasting effect on environmental law. The first limit boils down to the fact that because “value” is an ineluctably human construction, any claims about the value of nature necessarily rely on considerations that only humans can regard as values. This is most true of anthropocentric conceptions of value, where “[a]ny claim about the value of nature must call on considerations that humans can regard as values, that is, which they can imagine themselves pursuing and respecting.” But this limit also applies to biocentric and ecocentric theories that value nature intrinsically, because even if we do not confer value on nature, we still respond to value, and such response is contingent on our ability to recognize something as being “of value” in the first place. This limitation on value theory gives rise to the second: an inability to promote action. In other words, regardless of whether we adopt an intrinsic or instrumental approach to valuing nature, neither one tells us anything about how to protect that value. Purdy uses the Endangered Species Act to illustrate this point, explaining that neither interpreting the Act from an intrinsic perspective (e.g., spotted owls have intrinsic value because the Act prioritizes their survival over nearly any competing human interest), nor from an anthropocentric perspective (e.g., the Act expresses a human preference for species’ survival) does anything to inform the Act’s operation. As with intrinsic and instrumental valuations of nature, individualism’s and holism’s uncompromising stances undermine their usefulness as practical environmental ethics. Each of these competing theories stubbornly refuses to acquiesce to any kind of moral pluralism in the belief that “seiz[ing] on one aspect of environmental value and exclud[ing] competing considerations [is] in the service of theoretical consistency.” The irony, however, is that environmental law turned away from value theory precisely because its competing variants could not generate a consistent answer to the question of how we should value nature. Accordingly, liberation theology, as any other religious tradition with an activist social agenda, struggles to have a lasting impact on law and public policy because it must render unto Caesar what is Caesar’s. Liberation theology resides simultaneously in separate realms. On one side is the realm of the spirit, where liberation theology dwells in eternity, infinity, and possibility. On the other side is the material world, where temporality, finitude, and necessity hold sway. Fortunately for environmental law, it only has to worry about the here and now. Unfortunately, we live in a time where the nation’s environmental values are swiftly changing in the face of anthropogenic environmental problems of global significance, thereby demanding significant overhaul of environmental law in order for it to adequately safeguard these values. Gustavo Gutiérrez, A Theology of Liberation: History, Politics and Salvation 196-203 (Sister Caridad Inda & John Eagleson, eds. and trans., 1973) [hereinafter A Theology of Liberation](originally published in Spanish as Teología de la liberación, Perspectivas 1971). Id. at 117 (“[P]overty expresses solidarity with the oppressed and a protest against oppression.”). Pope Francis I, Laudato Si’ ¶ 2 (2015); see also Cristina Maza, One Year Later, How a Pope’s Message on Climate Change Has Resonated, Christian Science Monitor (June 24, 2016), http://www.csmonitor.com/Environment/2016/0624/One-year-later-how-a-Pope-s-message-on-climate-has-resonated (“In the year since Pope Francis released his encyclical, Laudato Si’, imploring his followers and fellow believers to care for the earth and its creatures, observers say more and more Roman Catholics are beginning to view climate change as a moral issue in which caring for the earth and caring for the poor intersect.”). A Theology of Liberation, supra note 1, at 22. Pope Francis I, supra note 5, at § 15 ((quotingPope John Paul II, Redemptor Hominis ¶ 15 (1979)); see also Pope Francis I, Care for Creation,Thepopevideo.org (Feb. 5, 2016), http://thepopevideo.org/en/video/ care-creation.html (“The relationship between poverty and the fragility of the planet requires another way of managing the economy and measuring progress.”). See Leonardo Boff & Clodovis Boff, Introducing Liberation Theology 9 n.1 (Paul Burns trans., 24th prtg. 2011) (identifying the second Latin American bishops’ conference held at Medellín, Columbia in 1968, which met to discuss strategies for implementing the pronouncements of the Second Vatican Council, as the “official launching” of the theme of liberation in Latin America). See generally The Hope of Liberation in World Religions (Miguel A. De La Torre ed., 2008) (providing an analysis of the liberationist elements within a number of religious traditions). This is not always true, however. For example, consider the women’s liberation and animal liberation movements. See, e.g.,Sarah Krakoff, Planetarian Identity Formation and the Relocalization of Environmental Law, 64 Fla. L. Rev. 87, 92-93 (2012) (identifying the rapid growth of localism—“placing value on working and buying locally”—as a response to growing awareness about the dangers of climate change). See, e.g., Malavika Vyawahare, Faith Leaders Call for Climate Change Action, ClimateWire, Nov. 12, 2015, http://www.eenews.net/climatewire/stories/1060027860/search?keyword=pope+ francis (reporting on a symposium where more than fifty delegates representing a range of faiths expressed their hopes that members of all religions would rally around fighting both climate change and poverty). See Press Release, White House, U.S. Leadership and the Historic Paris Agreement to Combat Climate Change (Dec. 12, 2015), https://www.whitehouse.gov/the-press-office/2015/12/12/us-leadership-and-historic-paris-agreement-combat-climate-change (announcing the U.S.’s commitment to achieving the goals for combating climate change set forth in the Paris Agreement reached at the 21st Conference of the Parties of the United Nations Framework Convention on Climate Change). SeeRichard Herrmann, Pew Oceans Commission, America’s Living Oceans: Charting a Course for Sea Change 5, http://www.pewoceans.org/oceans/ press_release.asp. (2003) (“We have reached a crossroads where the cumulative effect of what we take from, and put into, the ocean substantially reduces the ability of marine ecosystems to produce the economic and ecological goods and services that we desire and need. What we once considered inexhaustible and resilient is, in fact, finite and fragile.”). See Jedidiah Purdy, After Nature: A Politics for the Anthropocene 1-2 (2015) [hereinafter After Nature] (acknowledging the general consensus in the scientific community that for some time the earth been in a new geological epoch, one in which “humans are a force, maybe the force, shaping the planet.”). Krakoff, supra note 12, at 98 (“The global atmosphere is a common-pool resource, and since industrialization, agents have acted in their rational self-interest by emitting greenhouse gases in order to benefit from inexpensive energy. Even now that we know about the market’s failure to internalize the cost of greenhouse gas emissions, rational actors will still opt for cheap energy over reductions in greenhouse gas emissions because of the possibility that a defector could undermine the regime of curbing emissions.”). See After Nature, supra note 16, at 2(“The Anthropocene finds its most radical expression in our acknowledgment that the familiar divide between people and the natural world is no longer useful or accurate.”). See id. at46 (arguing that “natural catastrophe amplifies existing inequality” because the wealthy are better able to absorb and acclimate to the harmful consequences of man-made ecological damage). See Jedidiah Purdy, Our Place in the World: A New Relationship for Environmental Ethics and Law, 62 Duke L.J. 857, 871-77 (2013) [hereinafter Our Place in the World] (explaining how philosophical accounts of environmental ethics in the 1970’s struggled to produce an agreed-upon basis for valuing nature that could be translated into law, thereby leading policymakers to turn to the economic theories that have defined environmental law for last four decades). See Linda Malone, Exercising Environmental Human Rights and Remedies in the United Nations System, 27 Wm.& Mary Envtl. L. & Pol’y Rev. 365, 365 (2002) (“Whenever environmental degradation results in a human harm that violates accepted human rights norms, an international, regional or domestic human rights committee, commission, and/or court may provide a remedy that can contribute effectively to rectifying the underlying environmental degradation as well as the human rights violation.”). See Our Place in the World, supra note 20, at 883 (arguing that the divide that has grown between environmental ethics and environmental law over the last forty years demands that the law reshape itself to reflect our creative ethical capacity). See After Nature, supra note 16, at 262 (“[E]verything is connected to everything else, often in subtle and hidden ways, and any attempt to master the whole from a single standpoint is hubris and likely to turn out badly.”). For an insightful and detailed analysis of the evolution of American views on the value of the environment over the country’s history, see generallyJedidiah Purdy, American Natures: The Shape of Conflict in Environmental Law, 36 Harv. Envtl. L. Rev. 169 (2012). Our Place in the World, supra note 20, at 871. Daniel A. Farber, The Story of Boomer: Pollution and the Common Law, 32 Ecology L.Q. 113, 132 (2005). (codified as amended at 42 U.S.C. §§ 4321–4347). Endangered Species Act of 1973, Pub. L. No. 93-205, 87 Stat. 844 (1973) (codified as amended at 16 U.S.C. §§ 1531-1534). See Willis Jenkins, Ecologies of Grace: Environmental Ethics and Christian Theology 31-32 (2008) (arguing that unlike biomedical ethics or business ethics, environmental ethics it has no “discernible social practices” upon which to base its inquiries). Id. at 42. Jenkins identifies two other secular strategies besides nature’s standing: the strategy of moral agency, id. at 46-51, and the strategy of ecological subjectivity, id. at 51-57. I have chosen to concentrate on the strategy of nature’s standing because its efforts to correlate “normative obligations with the moral status of the nonhuman world” typically set it in direct opposition to the “blinkered economic rationalism of many public policy justifications.” Id. at 42. John O’Neill, The Varieties of Intrinsic Virtue, 73 Monist 119, 119 (1992); see also Gary Varner, Biocentric Individualism, in Environmental Ethics 90, 92 (David Schmidtz & Elizabeth Willot eds., 2d ed. 2012) (“Intrinsic value is the value something has independently of its relationships to other things. If a thing has intrinsic value, then its existence (flourishing, etc.) makes the world a better place, independently of its value to anything else or any other entity’s awareness of it.”). Arne Naess, The Shallow and the Deep, Long-Range Ecology Movements, 16 Inquiry 95 (1973), reprinted in Environmental Ethics, supra note 37, at 129, 129 (contrasting “the Shallow Ecology movement,” which Naess describes as the “[f]ight against pollution and resource depletion” and having as its central objective “the health and affluence of people in the developed countries,” with “the Deep Ecology movement,” which he describes as “rejection of the man-in-environment image in favor of the relational, total-field image.”). Our Place in the World, supra note 20, at 871; see also Jenkins, supra note 33, at 42-43 (comparing J. Baird Callicott’s view of nature’s intrinsic value, which could generally be described as “biocentric,” with that of Holmes Rolston, which could generally be described as “ecocentric.”). Our Place in the World, supra note 20, at 872; see also, Jenkins, supra note 33, at 43 (identifying Eric Katz, Tom Regan, and Peter Singer as environmental ethicists who advocate for nature’s moral standing while rejecting intrinsic value theories). O’Neill, supra note 37, at 119. See Jenkins, supra note 33, at 19 (identifying these three theological strategies as “ecojustice,” “stewardship,” and “spiritual ecologies”). See id. at 19-20 (explaining that the correspondence of Roman Catholicism, Protestantism, and Eastern Orthodoxy with ecojustice, stewardship, and ecological spirituality, respectively, are only tendencies and not hard rules). See Michael Moody, Caring for Creation: Environmental Advocacy by Mainline Protestant Organizations, in The Quiet Hand of God 237, 239 (Robert Wuthnow & John Evans eds., 2002) (reporting that the term “ecojustice” was either coined or “made its public debut” in a 1972 strategic planning group of the American Baptist Churches). Compare Boff & Boff, supra note 8, at 14-15 (describing “pastoral theology” as a “middle level” of liberation theology that works as a “progressively integrating factor among pastors, theologians, and lay persons, all linked together around the same axis: their liberative mission.”), with Jenkins, supra note 33, at 62 (“In order to make environmental issues part of its churches’ enduring pastoral concerns, [ecojustice] redeployed Christian notions of justice to make appropriate response to nature fit with the rationale for existing humanitarian mission commitments.”). Moody, supra note 47, at 240. Jenkins, supra note 33, at 63. Learn About Environmental Justice, U.S. Environmental Protection Agency, https://www.epa.gov/environmentaljustice/learn-about-environmental-justice (last updated Mar. 29, 2016). Alternatively, Julia B. Latham Worsham characterizes environmental justice as founded upon “the concept that minorities bear a disproportionate percentage of environmental burdens.” Julia B. Latham Worsham, Disparate Impact Lawsuits under Title VI, Section 602: Can a Legal Tool Build Environmental Justice?, 27 B.C. Envtl. Aff. L. Rev. 631, 633. See Worsham, supra note 51, at 633-34 (crediting either a 1979 Texas environmental rights suit or a 1982 citizens’ protest “modeled after the civil rights protests of the 1960s” in Warren County, North Carolina against a polychlorinated biphenyl landfill as the root of the modern environmental justice movement). Worsham, though writing from a legal perspective, appears vulnerable to a criticism Jenkins levels against “[s]ociological observers of [environmental justice],” namely that they “tend to skip [environmental justice’s] associations with religion.” Willis Jenkins, The Future of Ethics: Sustainability, Social Justice, and Religious Creativity 206 (2013). Case in point, Jenkins notes that when the North Carolina citizens began their protest, “they marched out from a church,” see id., a fact Worsham omits. See Moody, supra note 47,at 239 (“[Ecojustice] predates—by more than a decade—the widespread recognition within the secular environmental movement of the importance of highlighting justice connections.”). See Videotape: What is “Environmental Justice”?, And Justice For All: Current Developments in Environmental Justice (Wm. & Mary Envtl. L. & Pol’y Rev. 2016), http://scholarship.law.wm.edu/elprsymposium/2016/ environmentaljustice/2/. Exec. Order No. 12,898, 3 C.F.R. 859 (1995), reprinted in 42 U.S.C. § 4321 (1994). Richard Bohannon & Kevin O’Brien, Saving the World (and the People in It, Too): Religion in Eco-Justice and Environmental Justice, in Inherited Land: The Changing Grounds of Religion and Ecology (2011) (ebook), http://web.a.ebscohost.com/ehost/detail?sid=fdb6238f-f577-44f4-b171-b78afeec536e@sessionmgr4003&vid=1#AN=914925&db=nlebk [http://search.ebscohost.com/login.aspx?direct=true&db=nlebk&AN=914925&site=ehost-live]. Jenkins, supra note 33,at 64. See Bohannon & O’Brien, supra note 56 (relying on the “Principles of Environmental Justice” developed by the First National People of Color Environmental Leadership Summit in 1991, “which have been used ever since to summarize the moral impulse behind the movement,” to argue that environmental justice does not “explicitly advocate on behalf of the nonhuman world for its own sake—the ‘health’ of the nonhuman world is implicitly for the benefit of ‘present and future generations’ of humans”). Jenkins, supra note 33,at 55 (“By insisting on fair distribution of environmental risks and benefits, environmental justice directs attention to inescapable ecological components of a decent human life.”). See Our Place in the World, supra note 20,at 873 (“Conceptually, the issue of intrinsic versus [instrumental] value rapidly produces a dilemma, an irresolvable standoff between anthropocentric and biocentric perspectives.”). See id. (“The mind is the theater, so to speak, in which we experience value; but that does not make the mind value’s source, any more than it creates the other people with whom we have relationships.”). Purdy identifies a potential resolution to this problem in the concept of uncanniness, which will be explored in Part IV. See id. at 875 (“Here the choice between the alternatives does have relevance to action, but each option is deeply unsatisfactory.”). Our Place in the World, supra note 20, at 876. Varner, supra note 37, at 91. See Elliott Sober, Philosophical Problems for Environmentalism, in Environmental Ethics, supra note 37, at 133 (making thissamepoint using different species of whales as an example). Our Place in the World, supra note 20 at 876. See Bohannon & O’Brien, supra note 56. See Sober, supra note 76, at 133 (explaining the dilemma of a holistic environmental ethic). Our Place in the World, supra note 20, at 875. Sober, supra note 76, at 137; see also After Nature, supra note 16, at 240 (making a similar point by asserting that human exploitation of domesticated animals should be no more “immune to ethical scrutiny” because humans “co-evolved” with those species than “slavery and gender segregation should be immune because they are widespread in human history.”). See Our Place in the World, supra note 20, at 877. See Jenkins, supra note 33, at 49 (quoting Bronislaw Szerszynski, Wallace Heim & Claire Waterton, Nature Performed: Environment, Culture and Performance 1 (2003)) (“[P]ractical rationality . . . . ‘is being driven not just by intellectual curiosity but also by an increasing sense that existing ways of thinking about nature are inadequate to practical needs,’ that in order to describe the dynamic relations among environment and society, one is ‘not well served by the noun-dominated languages used for describing both.’”). Our Place in the World, supra note 20, at 863 (identifying the crucibles as “agricultural and food systems, the ethical status of animals, and climate change”). After Nature, supra note 16, at 241. Gustavo Gutiérrez, Toward A New Method: Theology and Liberation, inGustavo Gutiérrez: Essential Writings 23, 30 (James B. Nickoloff ed., 1996).